Nice to hear speeches of MMS which are hard to come.His secret weapon, the silence is a potent weapon against thousands of detractors. Lack of spine or courage to stand up against the family corroded his image as a ruler. History will judge him better. A viral video made by a white skinned foreigner for the Indians who generally nurture respect for all white skinned foreigners.The video makers rationale could be that for a message to be sent effectively, use the voice and face of a white skinned westerner. Because we Indians are obsessed with the white skin and towards everything western. But remember this is the same country where black skinned Rama and Krishna lived. He is a good economist and a good statesman but a bad politician without spine. The reason these people hate Modi tooth and nail is because they know that their political future is at stake. They were always like this only. They tried hard in the past and put many hurdles for the Gujarat's lion in his campaign towards the Delhi Sultanate. They were somewhat assured when he became part of the establishment. The Aakrosh that they employ now should have been shown when Commonwealth Games scam was happening. They were overseeing the loot and this dumb man was allowing all this to happen. Now when a nationwide cleanup is happening, these idiots take a regressive step. I am glad atleast they allowed GST to happen.They delayed it so that nation should not progress under Modi. 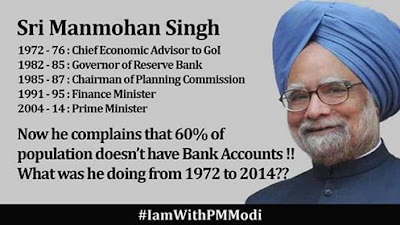 But Shame on Modi for having made deals with the opposition and not putting Coal Scam Mohansingh in jail for looting nation's money for the dynasty.